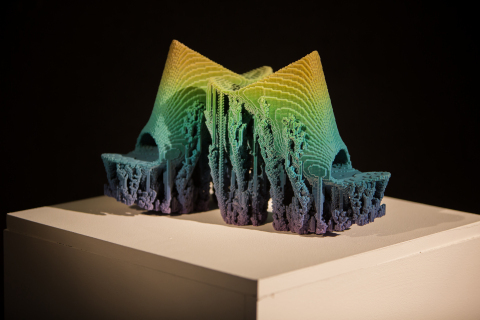 MINNEAPOLIS & REHOVOT, Israel — (BUSINESS WIRE) — March 14, 2016 — Stratasys Ltd. (Nasdaq: SSYS), the 3D printing and additive manufacturing solutions company, today announced that some of its most high-profile 3D printed fashion pieces are headlining #techstyle, a new co-curated exhibition with Lauren Whitley and Pam Parmal at the Museum of Fine Arts Boston (MFA) (March 6th – July 10th 2016). Exploring the synergy between fashion and technology, the exhibition includes ‘Anthozoa’, a 3D printed cape and skirt designed by Prof. Neri Oxman and Iris van Herpen; ‘Harmonograph’ 3D printed dress designed by threeASFOUR and Travis Fitch; as well as 3D printed ‘Molecule’ shoes designed by Francis Bitonti. “I think one of the most amazing aspects of 3D printing is that it enables the fashion designer to move beyond conventional sketching and draping methods and allows them to imagine and conceive a garment in three dimensions. Many of the designers represented in #techstyle have harnessed Stratasys’ unique multi-material 3D printing technology, and the process is integral to the actual creation of the pieces. Francis Bitonti’s shoes, for example, seek to mimic organic cellular processes which cannot be controlled, yet he was able to “grow” the shoes in a way that’s simply not possible with other forms of production. Recently lighting up the New York Fashion Week catwalk, the 3D printed Harmonograph dress circles around the body in three spirals, following the geometry of the Fibonacci sequence and optically portraying the effect of a harmonograph. Combining geometry, biology and logarithms, the designs were entirely dependent on the new possibilities that Stratasys multi-color, multi-material 3D printing is able to provide – most notably, the ability to mix both rigid and rubber materials to any degree of flexibility, in any color, within a single print [Video: Stratasys Defines New Movement in 3D Printed Fashion at New York Fashion Week]. Another outcome of this technology and a star feature of #techstyle is ‘Anthozoa’. The 3D printed piece dazzled the catwalks of Paris Fashion Week in January 2013 as part of Iris van Herpen’s Haute Couture show, ‘VOLTAGE’. The elaborate 3D printed skirt and cape created in collaboration with Prof. Neri Oxman, incorporates hard and soft materials within the design – which is crucial to the movement and texture of the piece. This allowed Oxman and van Herpen to design a “second skin” for the body acting as armor-in-motion [Video: 3D Printed Dress on the Catwalk at Paris Fashion Week]. Stratasys fashion and art pieces are featured in permanent collections across the world’s most recognized museums, including MoMA New York, Centre Pompidou Paris, Science Museum London, Museum of Fine Arts Boston, San Francisco Museum of Modern Art and MAK Vienna. Stratasys has produced 3D printed pieces for a number of fashion shows and catwalks including Paris Fashion Week (January 2013) – Fall/Winter Haute Couture with Iris van Herpen and Prof. Neri Oxman, Paris Fashion Week (July 2013) – Iris van Herpen’s Couture Show: “Wilderness Embodied’ for Iris van Herpen Design Collection with Rem D. Koolhaas [Video: Designer 3D Printed Shoes Prowl the Catwalks at Paris Fashion Week], and most recently at New York Fashion Week 2016 headlining threeASFOUR’s Fall/Winter 2016 collection.